Die Bäume vor meinem Fenster II, 1956. This caught my eye in an otherwise mildly disappointing room devoted to Otto Steinert at the Tate Modern, part of the ‘Structure & Clarity’ display. It’s not just that he was interested in movement: plenty of photographers have shared that. It’s not even that he managed to make something so evocative in such an ordinary environment. What really grabs me is that each cluster of branches moves in a direction of its own. This to my mind exactly mimics what painters do when they want to indicate branches in motion. Because if the movement were all the same way the poor trees would look as though they were being uprooted in a Force 10 or worse. I had thought it was painters’ licence, but Steinert shows it to be fact. No doubt the explanation is pretty straightforward: I imagine something along the lines of the movement of each cluster being caused not simply by the wind, but by sympathetic and harmonic vibrations set up in the branches with different resulting aggregate forces. Or turbulence from one cluster of leaves deflecting the wind before it strikes the next cluster. Or bendier twigs moving differently to more resistant ones. Or any combination of those. The physics are no doubt not very exciting. The picture is. Steinert is a very interesting figure, and I’m glad the Tate has devoted even a sketchy effort to bringing him to attention in London. I find that I’m still surprised by the provincialism of photographic rolls of honour. In one or two areas, like fashion or contemporary art, the great photographic names of the upper tiers seem more or less international. You could get very weary travelling around the world seeing exactly the same star works at art fairs and auctions. But in the history of photography and in its various applied areas of specialism, the separations of the nation state are still very much the rule. So, for example, the daguerreotypist partners Albert Sands Southworth and Josiah Johnson Hawes are major lights in the American pantheon barely mentioned in Europe. Mid-twentieth century Germany has more reason than most periods to have been awkward for outsiders to become interested in, and we can understand that. Yet a photographer like Otto Steinert is not some provincial drudge made visible by local jingoism or chauvinism alone. It remains surprising to me that photography — which seems so naturally able to cross cultural boundaries and even to erase them — should in fact be so limited by the language of publication, the market of the publisher, and the funding background of the institutions involved in the promotion of any one name or group. These things are not easy to break down, and a small display of Steinert in London is a good thing: there have been too few by far. But I do note sourly that if anyone were interested in finding out more about this pioneering photographer, the Tate’s online offering is discouraging. 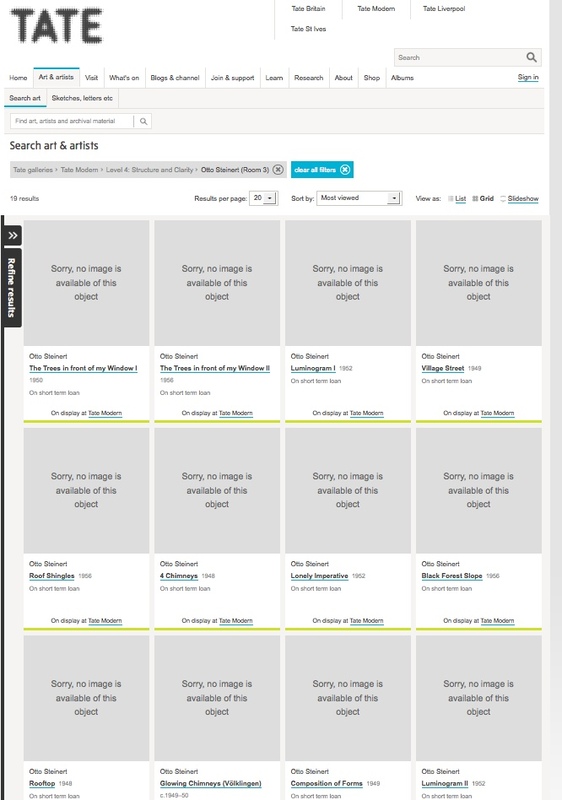 Search results for the pictures in the Steinert display at Tate. This search was made while the display was open to the public. One can understand that there are issues of intellectual property which might well prevent the pictures being shown. But it is feeble of the Tate to leave it simply at that. A licence to display them for the relevant period could easily have been obtained. Failing that, good reference should have been made to other places where reproductions of the pictures might be seen. For you can easily imagine a visitor intrigued enough by the Steinert room to seek to find out more, rapidly becoming discouraged or distracted by the blank result of the most obvious first step in the search. And that adds one little element in the continued restricted availability of Otto Steinert to new audiences, in direct contradiction of what the Tate itself is clearly trying to do by showing original prints in the galleries. There is a perfectly decent reproduction (with a virtual magnifier) of the trees outside Steinert’s window HERE courtesy of the German auction house Lempertz. Work in Progress at the Media Space in London. The Media Space was planned to improve the visibility of one of the great photographic collections in the world. There is now no effective state policy for the provision of the culture of photography to the nation. There is today no specialist photography officer at the Department for Culture Media and Sport. There has only ever been one Photography Officer at the Arts Council, Barry Lane, and his tenure finished many years ago. The Arts Council is itself on its knees. Its homologue, the Museums Libraries and Archives Council, which was supposed to deal specifically with those institutions that held collections, has recently been abolished. The only serious national touring programme of photographic exhibitions now takes place under the umbrella of the Artist Rooms programme, administered by the Tate from the donation of one man, the art dealer Anthony d’Offay. No need to go on. Photography exists as the most popular and most important sector of the visual arts in an administrative and institutional framework which has badly let it down over many years. It suffers from serial widespread long-term institutional failure of strategy and of personnel. Small wonder that we have now reached the point where the National Media Museum – which, in spite of its inadequacies, remains the home of a world-class collection of historically important photography – is facing imminent closure. Beyond the laughably poor grammar coming out of the ministry of culture, a number of things are pretty clear. There is obviously going to be a huge shortfall in centrally provided income to the Science Museum Group. It is also obvious that the Department of Culture, Media and Sport is not in a position to defend its dependent institutions. The weakest ministry of culture in Europe seems quite happy to stand by and let the various funding axes fall. Culture is a major industry in the UK, but its lobbyists are assumed to be feeble luvvies and are brushed aside by competing claims on government funds. Cultural policy in Britain is made on the hoof and unmade on a whim. In that context, photography suffers, yet it should not. Photography, which touches everything and everyone, easily meets all those criteria of social utility which were the Blairite vision of how culture should pay its way in society (and which the present government has inherited faute de mieux). Photography is our literacy and our art. Photography in any institution appeals to the full diverse range of population. It is accessible to all (from junior Key Stages in the curriculum to adults, and from every profession or walk of life). Photography is transnational and transcultural and doesn’t necessarily take place in any one language. It carries information and opinion equally, and represents the shared vocabulary of all of us. Photography includes high art and low commerce, and to be intrigued by photographs means potentially to be interested by anything at all. Photography is the only medium whose history is a history of continuous boom: photography has moved into every field, and convulsed each. It is also a remarkably cheap medium to treat, being relatively unaffected by transfer to digital formats in which everybody can store and send its products. Photography, in other words, is the one cultural activity that presses all the buttons. Let alone its fundamental cultural importance, as the forerunner of cinema and digital imaging and everything visual in between. Many of the governing ideas of our society were first articulated in photography. Photography is demotic and vernacular and at the same time high-art and high tech. Photography showed you things but didn’t always explain them: it was in photography that it first became possible to be exposed to any kind of argument without analysis. A thousand things developed from that. Take the sound bite, for example, so standard a part of our media-habituated world – what is the sound bite? A photograph in which visual is translated into verbal. We learnt to accept such things and work with them in photographs. Same for a hundred tics and tropes in half a dozen other fields. Photography is fundamental to a host of large industries which have developed around it: fashion, pop music, video gaming, even the tourist industry and sport… Photography is one of the engines that have pulled us out of the age of manufacture into the service age. It’s as important as that. 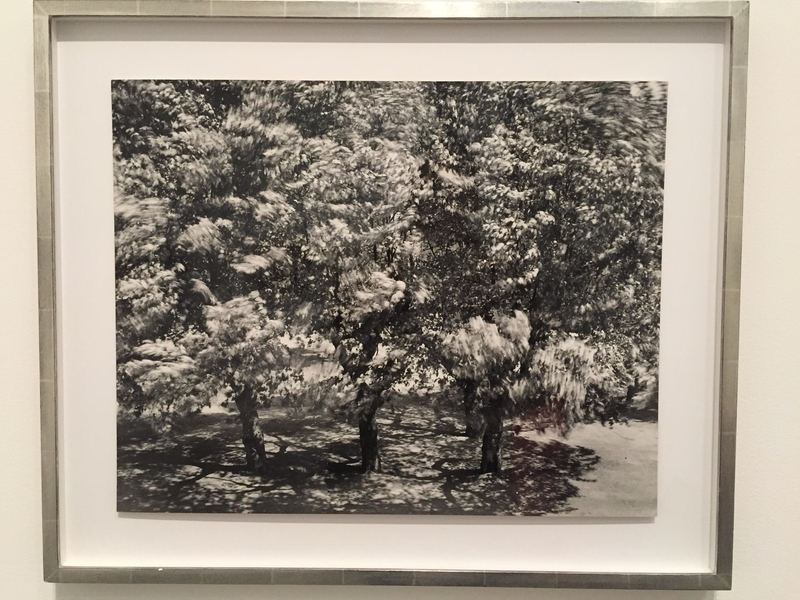 Photography is the fundamental core of contemporary art, too: you could put it in a nutshell and say that those artists who haven’t run to it, have run from it. So the already weak provision to the nation of institutional coverage of this most vital – and most popular – field is threatened. This year is the thirtieth anniversary of the foundation of the Bradford Museum. When it opened, many people questioned its location because culture was then even more concentrated in London than now. But they also questioned whether there should be any such museum at all: photography was shown much less than it is now, and many wondered whether there was either demand or reason for such a museum. And photography was from the beginning the core of the museum. Its first Head was Colin Ford, perhaps the only UK curator of photographs who one could have imagined at the Harry Ransom Center or MOMA or the Bibliothèque Nationale or any of the other really proper photographic collections. As somebody (not from photography circles) said to me the other day: “The thing about Colin Ford is that we all knew who he was. I haven’t a clue about any of them that followed.” When Ford opened Bradford, it had something like eight galleries, showing everything from emerging photographers to the most established. It was in an odd place as far as London culture-vultures were concerned, but it really was the national museum of photography. After his departure, a lot of that concentration was diluted. Let us recall that the absorption of the Royal Photographic Society (RPS) collections by the Bradford Museum in 2003, after a relatively rapid negotiation, was the moment at which the Bradford collections in photography became truly world class. But it was also the moment at which the policy division between the Science Museum and the Victoria and Albert Museum was most visibly and publicly flouted. Officially still today, the V&A holds the national collections of the art of photography, and the National Media Museum the national collection of photography, which also includes art photography. Photography not being a discipline that lends itself particularly to tight categorisations of this kind, it has long been obvious that there are large and problematic areas of overlap. Still, once the RPS collection went to Bradford, it was then abundantly clear that (in photography, at least) the great museum fiefdoms were fighting each for itself and that no overarching policy existed to control them. One of the main players in the transfer of the collections from the RPS to Bradford was Amanda Nevill, who became Head of the National Museum of Photography, Film and Television (as it then was), after being head of the Royal Photographic Society. Many other names are involved in this story, but let us just hold on to that one. It might be a good time to ask some very old-fashioned questions: Cui bono? Who benefits if the National Media Museum should close down? Still, let me draw out a plausible map of what might happen, and then let us ask the people in charge of our cultural institutions to explain the position. The National Media Museum has been for a certain time in trouble. You could argue that it has done a miraculous job for the city of Bradford, acting as the main cultural focus in a city that badly needed something of the sort. But it has done a less good job for photography nationally, even if that is for reasons which are partly not the Museum’s own responsibility: chronic underfunding; lack of a resounding mission; lousy train services from elsewhere in the country (making it hard to get to); diminished curatorial staff and diminished spend on the collections, with a correspondingly high proportionate spend on fund-raising and marketing and all the ancillary functions of a museum. The position has grown so bad that the Museum has advanced a long way in its plan to open an out-station devoted to showcasing the photography collection in the Science Museum in London; a peculiar plan whereby the daughter-house will implant a branch within the mother-house. This, as I have written elsewhere, [ Photomonitor : Media Space at the Science Museum, by Francis Hodgson ] is a very public admission of the failure of one major part of its remit. The great collections of photography in Bradford’s care are not being properly shown to the nation. But consider what might plausibly now happen. The National Railway Museum in York and the Museum of Science and Industry in Manchester both serve cities with a far heavier lobbying punch than Bradford. Manchester is arguably the founding city of the industrial revolution, and York has built up a huge tourist industry in the business of heritage and history. Neither will give up their museums easily. It will look possible to concoct an argument by which Bradford loses its own simply because one of the three has to go under the cuts. If that should happen, it will become necessary to rehouse the collections. Manchester is the city to which large parts of the BBC has been moved over recent years. Granada was always the best commercial franchise; add the BBC and it becomes plausible to think of Manchester as a specialist television town. What could be easier than to make the argument that the television collections from Bradford should go there, and even perhaps to the Museum of Science and Industry? Similarly for film. The BFI (British Film Institute) already exists, is in London, and would perhaps happily stake a claim to accommodate the relevant Bradford collections. Although the BFI has been rationalising its technical collections. It set a line in the sand when it closed the Museum of the Moving Image in 1999 and might be unwilling to reverse that decision. But the Director of the BFI is that same Amanda Nevill, mentioned above, who might welcome with open arms a chunk of the collection she better than almost anyone knows the value of. There remain the great historic photographs collections. The Media Museum has been inching towards London anyway, in the proposed ‘Media Space at the Science Museum’. How convenient would it be for the whole collection to have to move back to London, where the Media Space is already earmarked for its display? No more talk of the supposedly vast cultural importance of archiving websites and social media and so on. But the British Library is quietly making great strides on that score anyway, as it quite properly should. Get rid of the Bradford Museum, to the great detriment of the city of Bradford, but to large savings, and suddenly the national collections under its control fall into convenient slots, separated by medium. You know what? It could all have been planned that way. As a matter of fact, it is impossible to see UK arts administrators competent enough to have engineered such a complicated dance towards an outcome. It is more likely the standard UK fare of botched job and muddling along and yielding to pressure. This much is clear: the UK national photographic institutions are in a mess which is likely to get a whole lot worse. Whatever happens, it shouldn’t happen without proper debate and without proper planning.